Ever thought about using your wheelchair joystick to send an e mail or turn on your lights? It is easy for someone to assume that their wheelchair can only be used for driving. However, wheelchair manufacturers have developed their products in recent years and considered the needs of the user such as the need to also interact with their mobile phone, PC or even a TV. 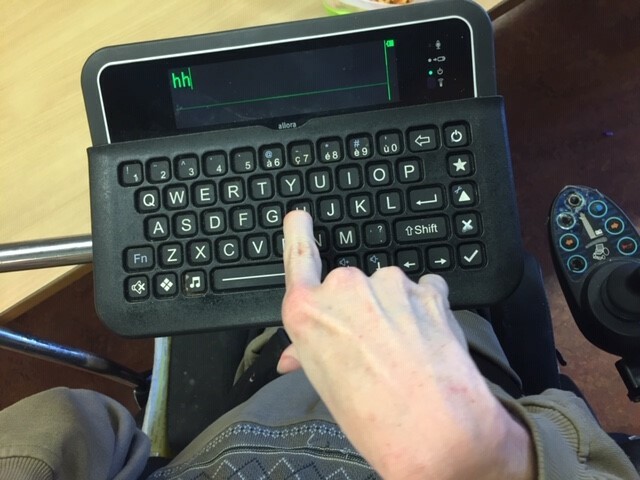 As well as the basic chair functions such as driving or controlling the actuators these electronic systems can also enable control of a computer or portable devices and so the integration of environmental controls is possible on most power wheelchairs. The same controls that the user drives the power wheelchair with, typically a joystick, can also be used to control an appliance within their environment. 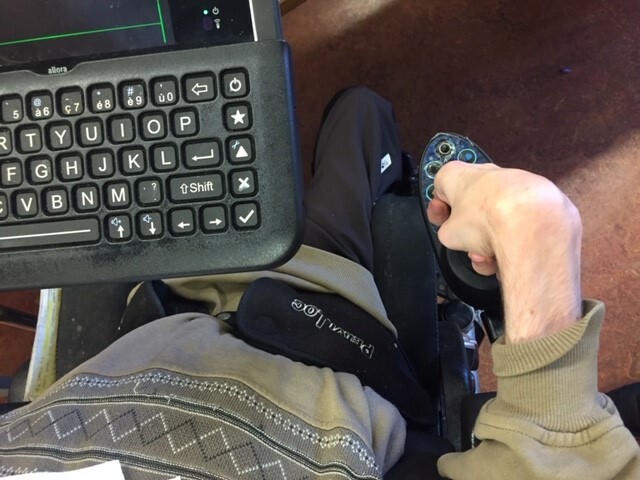 Another benefit of integrating control of other devices within the wheelchair joystick is that it may help to ensure the user maintains a good posture while operating other devices. All of the main wheelchair controller manufacturers have Bluetooth mouse options, including Dynamics Controls with their Linx controller, Curtis instrument’s quantum q-logic controller, and Curtiss-Wright – Rnet controls. For example for chairs with R-net controls you can replace the old joystick with a CJSM2 –BT as seen in the picture here. 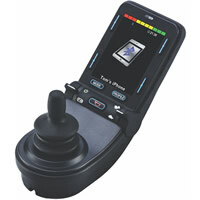 This R-net Joystick Module has Infra-Red (IR) capabilities included. IR technology is widely used to remotely control household devices such as TVs, DVD players, and multi-media systems, as well as some home-automation equipment. Individual IR commands can be learned from an appliance’s remote handset and stored in the CJSM2. Also Integrated Bluetooth technology is an option, to enable control of computers, Android tablets, iPads, iPhones and other smart devices from a powered wheelchair. To switch between the devices, the user simply navigates the menu and selects the device they wish to control. The R-net’s CJSM2 can easily replace the existing rnet joystick module, with no system re-configuration or programming required. Although not all power wheelchairs can be fitted with Bluetooth mouse-enabled joysticks, there are some good alternatives that may still work. The BJoy ring is a sensor that can be fitted to most wheelchair joysticks where deflections of the joystick can be translated to mouse movements picked up on a Bluetooth mouse receiver placed on a tablet or PC. The not so good: This capability is only available on high spec wheelchair systems. 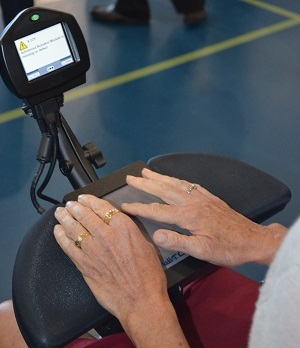 The verdict: Using a wheelchair joystick that is Bluetooth enabled will ensure the user maintains a good posture while operating their other devices. This is great but so far nothing really groundbreaking, we have seen services like this before. Forward thinking cities with deep pockets like London and Ontario have had similar accessibility features built into their public transport route planners for the last decade. That is a lot easier to achieve however because you are dealing with a finite number of route options. Where Route4u is breaking new ground is that it facilitates this level of planning throughout an entire city. It does this by using the technology built into smartphones to provide crowdsourced data that constantly updates the maps. If you are using a wheelchair or scooter the sensors on your smartphone can measure the level of vibration experienced on a journey. 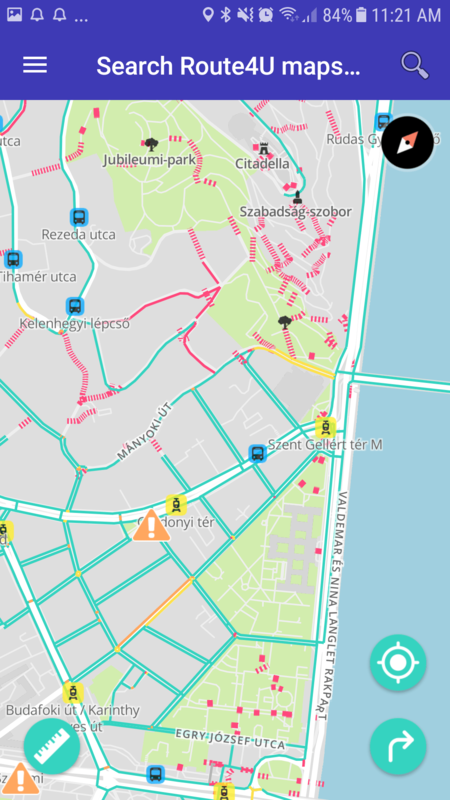 This data is sent back to route4u who use it to estimate the comfort experienced on that that journey, giving other users access to even more information on which to base their route choice. The user doesn’t have to do anything, they are helping to improve the service by simply using it. 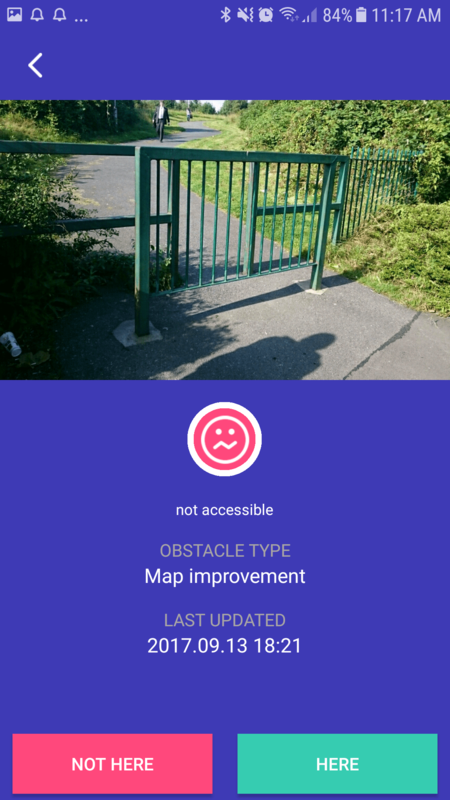 Users can also more proactively improve the service by marking obstacles they encounter on their journey. The obstacle can be marked as temporary or permanent. 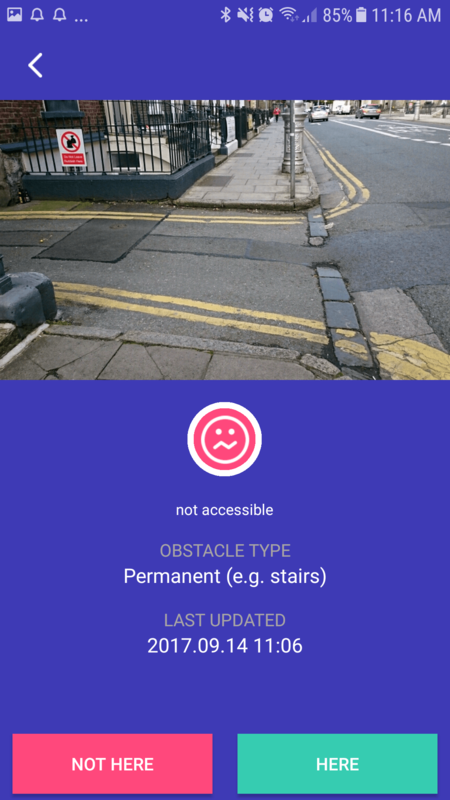 Temporary obstacles like road works or those ubiquitous sandwich boards that litter our pavements will remain on the map helping to inform the accessibility of the route until another user confirms they have been removed and enters that information. If you connect route4u to your FaceBook account you get access to a points based reward system. This allows you compete with friends and have your own league table. In Budapest where they are already well established they have linked with sponsors who allow you cash points in for more tangible rewards like a free breakfast or refreshment. These gamification features should help encourage users less inclined towards altruism to participate and that is key. Route4u when established relies on its users to keep information up to date. This type of service based on crowdsourced data is a proven model, particularly in the route planning sphere. It’s a bit of a catch 22 however as a service needs to be useful first to attract users. It is early days for Route4u in Dublin and Tamas and Peter acknowledge that a lot of work needs to be done before promoting the service here. Over the next few months their team will begin mapping Dublin city centre, this way, when they launch there will be the foundation of an accessible route finding service which people can use, update and build upon. 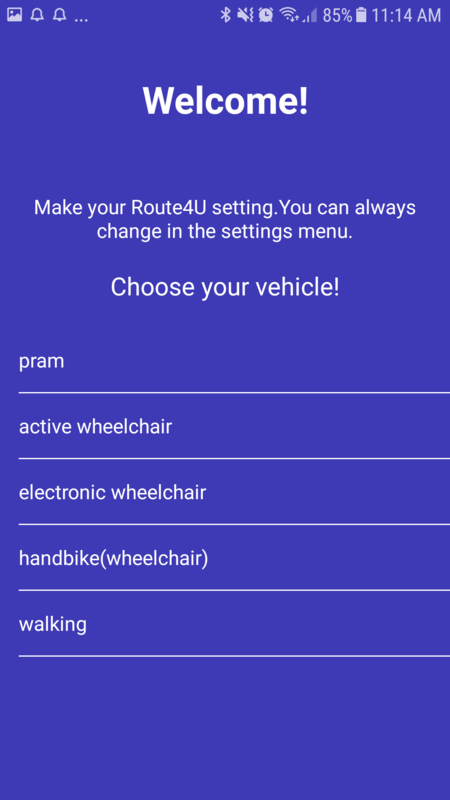 While route4u has obvious benefits for end users with mobility difficulties there is another beneficiary of the kind of data this service will generate. Tamas and Peter were also keen to point out how this information could be used by local authorities to identify where infrastructure improvements are most needed and where investment will yield the most return. In the long run this will help Dublin and her residents tackle the accessibility problem from both sides making it a truly smart solution. EyeTech Digital Systems, has partnered with Quantum Rehab to bring eye controlled wheel chairs to individuals who are unable to use hand controls. EyeTech’s eye tracking technology mounts directly to a tablet PC and allows the user to control the entire computer using eye movements. The system then mounts to the wheelchair. An eye control driving app gives the user the ability to drive hands-free. The driving controls are overlaid on the scene camera. 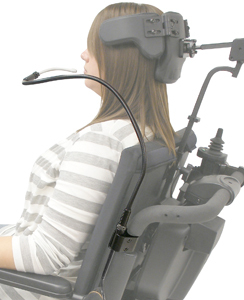 Simply looking at the driving controls activates them to control the basic directions and movements of the chair. Quantum Rehab® products, including a range of rehab mobility technologies such as the Q6 Edge® 2.0 and Quantum Series of power bases. 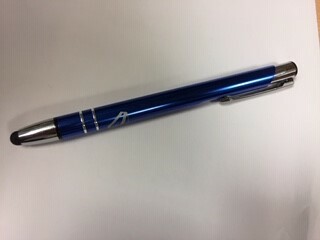 www.QuantumRehab.com. LC Seating and MMS Medical. This post is following on from an earlier post on Alternative ways to control a power wheelchair. Standard wheelchair joysticks are controlled by moving or deflecting the joystick in the direction that you wish to travel. 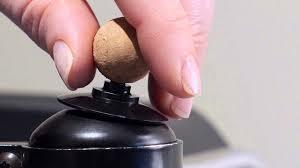 The force required to deflect a joystick is either provided by the manufacturer in either Newtons or in grams. You can think of 1 newton as being about 100g. 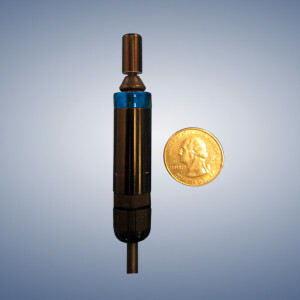 A standard wheelchair joystick will typically have an operation force of about 200 to 250 grams. This may be irrelevant to most but some individuals the force required to deflect the joystick may be the difference between being able to use the joystick or not. Unfortunately the HMC mini joystick has gone off the market but luckily there are a few good alternative options of joysticks that require quite a low force to operate. Relatively new onto the market is a company called Mo-Vis. They manufacture two low force joysticks. One is the Micro Joystick. The Micro Joystick is a small proportional joystick, especially designed for people with poor or weak muscular power and/or restricted movement. This joystick can be controlled by finger, lip, tongue. Dimensions (h 50 mm/1.97 in – Ø 29 mm/1.41 in). It can be controlled with a minimal force of (+- 10 grams) which is very similar to the HMC mini joystick. Another joystick from Mo-Vis is the Multi Joystick. It is a larger joystick and the force required for activation is 50 grams, but still quite a good bit less that the standard joystick. It provides two useful jack inputs for switches to control on/off or as a mode switch. Adaptive Switch Laboratories produce another nice option. 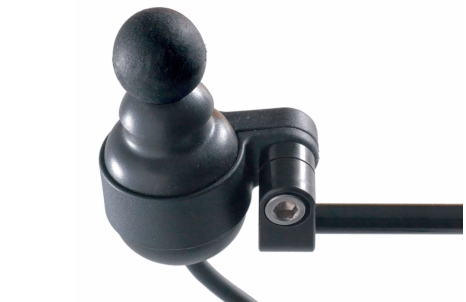 The ASL 130 Micro Extremity Control (MEC) only requires 18 grams of force to deflect the joystick. It has a unique feature of having a built in mode change function. Pushing directly down from neutral position will reset the chair to the next mode that is turned on. This will benefit anyone that does not have another switch site available or has difficulty taking their hand on and off the joystick. Finally a company called Switch-It produce two light touch joysticks. The MICROGUIDE takes about 40 grams of force for activation. Approximate Joystick Dimensions: Diameter: 5/8” x Height without knob: 2.8”. They have also a joystick called the MICROPILOT . The MicroPilot is a light touch proportional miniature joystick that required no deflection (throw). Activating force is 10 grams. Have you even wanted to control your TV, computer or any other piece of equipment from your power wheelchair? The DX-ECU is an optional module for power wheelchairs which have DX Dynamic Controls. This module provides a way to control external devices to the power wheelchair, typically a communication machine, environmental control unit, or even a computer. 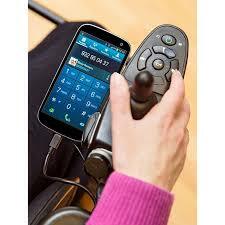 These devices can be controlled through your wheelchair joystick or other input device. Have a look at the video below to learn more. If you have queries on what is available for your power wheelchair why not ask your wheelchair supplier or occupational therapist? Power wheelchairs can be a great way for people with limited mobility to get around. The standard way to control a power wheelchair is via a joystick typically mounted on either side of the wheelchair. However, if you have a limited range of motion or strength, then using the standard joystick may be difficult. There are a growing number of alternative options that are becoming available. These include light touch mini joysticks, switches, touchpads and sip and puff controls. 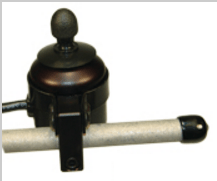 Mini Joystick are usually much smaller than the standard wheelchair joystick. They required less force to deflect or operate the joystick, which may be a low as 18g of pressure. Like a standard wheelchair joystick most of them are proportional, so the more they are deflected the faster the chair will move. 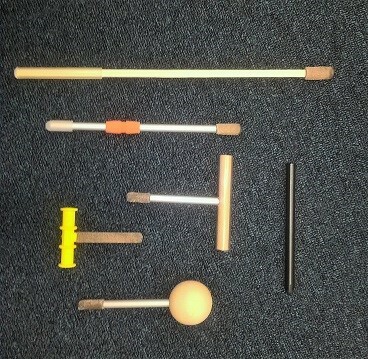 However some joysticks are controlled by the pressure applied and do not deflect. To keep the joystick compact, buttons for the power, lights and actuators are not part of the joystick housing, as these controls are operated by alternative methods. Mini joysticks may activate a mode change on pushing directly down on the joystick from neutral position. Switches by their nature do not have proportional control. So activating a switch will move in a particular direction and releasing the switch will stop. However as a power wheelchair’s acceleration and deceleration characteristics can be setup to be gradual, driving can still be smooth. Switches can be mechanical momentary switches or based on proximity where no physical contact is required. Multiple switches can be used, one for each direction, three switches as in a head array or a single switch that is used with some scanning display. These are operated by sucking and blowing on a mouthpiece. Sip and puff pressures are programmable and will also have a mode change feature in order to operate other chair controls such as lights or actuators. They require quite a bit of practice by the user to get good at driving. Not only does the wheelchair electronics distinguish between a sip and a puff, it can also recognize the strength of the sip and puff. Basic Sip and Puff pressure is interpretation as… HARD PUFF – Forward, SOFT PUFF – Right, SOFT SIP – Left and HARD SIP – Reverse. In some cases, it may be necessary to also connect an emergency stop switch. The stop switch needs to be mounted in a position for easy activation by the user. Further details can be found from the following supplier websites. For power wheelchair users who find the joystick controller difficult to use there are various other ways to control and drive a wheelchair. Most of these alternatives are based around switches. Here is an interesting alternative to driving a powered wheelchair which I have recently got on loan. The TouchDrive 2 is an alternative wheelchair controller from SwitchIt. SwitchIt produce a range of proportional and non-proportional wheelchair controllers. This one uses touchscreen technology to drive a power wheelchair. 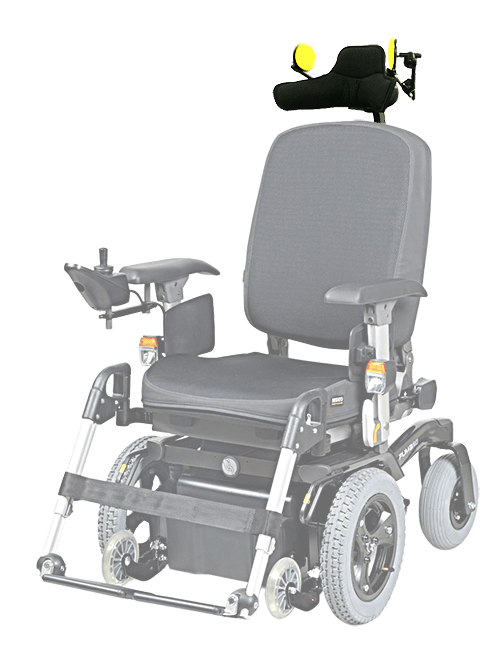 It can be set-up on power wheelchairs that have P&G R-Net, Q-Logic/ Curtis and Dynamic DX electronics systems, which accounts for many power wheelchairs. As its due back soon, I made a quick video to demonstrate it. PG Drives Technology have announced the introduction of a new device which enables a power wheelchair user to control their iPad, iPod touch or iPhone. It’s called the iDevice Module and can be added to the R-net system. It will allow the power wheelchair user to control their iOS device with the same input device as they use to drive their wheelchair. For example deflecting the joystick forward, backwards, left and right navigates and select icons or menu items. Also the iDevice Module enables control of an iDevice using the built-in Accessibility options of Switch Control or VoiceOver. So for example turning Switch Control on could enable external switches to be assigned to commonly used functions, such as Select, Home, Previous or Next on the iDevice. 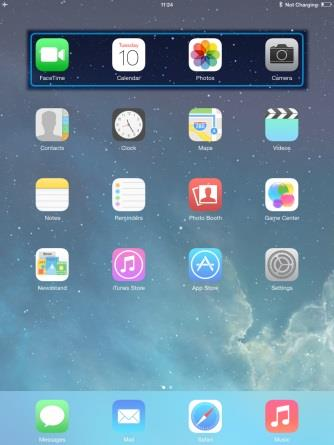 iOS 7 based devices have these built-in Accessibility features. Microsoft’s first-ever company wide Hacakthon demonstrates what can be achieved when people work together with a common goal. The project brought together a cross-discipline team of researchers, engineers, designers, program managers and media professionals from across Microsoft. 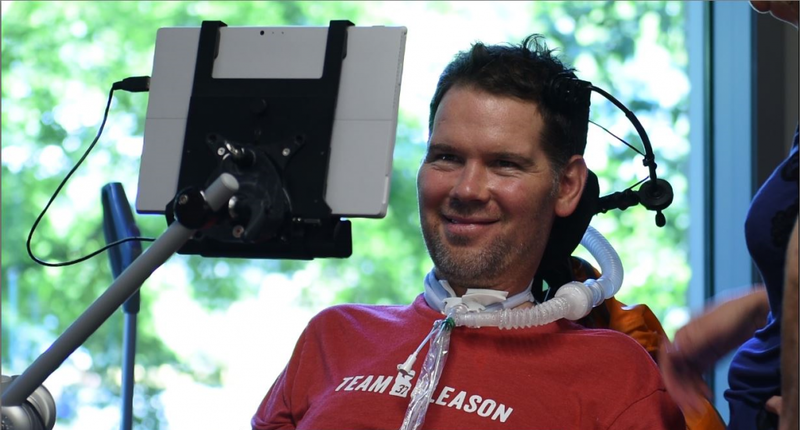 The global Hackathon’s grand prize winner “Ability Eye Gaze” had produced some great results for a former footballer, Steve Gleason now living with ALS (Motor Neuron’s Disease). Part of the team’s accomplishments were to help Gleason “drive” his wheelchair. The team used eyegaze technology with the Surface Pro 3, created a user interface to navigate the wheelchair and devised a way to use a Kinect sensor to safely manoeuvre around objects when detected.